This lipstick is kinda overrated to me. Yes it's creamy and silky but it does not settle on your lips unless you use your finger to blend it. Plus the color is so "WRONG" for me. I didn't go buy it myself. Well, long story short, I picked the color over the phone. But no worries, for Rs. 1730 I'll make it work. By that, I mean either apply sparingly or mix it with other colors. The only thing i absolutely love about it is the luxurious packaging. Love all of these. Good luck getting L'Oreal Infallible off your lips! Long-wear indeed. 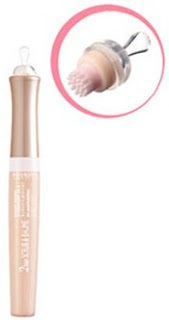 ♥Bourjois Maxi Frange Mascara (Waterproof) ~ Isn't the packaging of this so cute? !I didn't like this mascara very much when I first got it but I used it again yesterday and was surprised to see that it's not so bad. I'll try to use it up. ♥Maybelline Unstoppable Eyeliner (Black) ~ Love this! 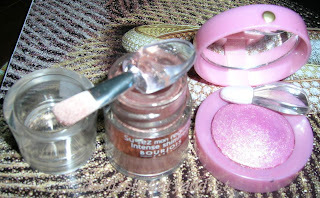 ♥Bourjois Sparkling Eyeliner ~31 Noir Eblouissant (Rs.250) ~ Love this too. This is such a fun product. I like scrubbing my lips with the little buffer because it sort of increases the blood circulation to the lips which plumps them up and brings a nice natural color. The glycerine-infused iridescent balm does improve my chapped lips. I sure won't be throwing away this tube even when I've used up the balm. Mini Bourjois Eau De Gloss in Framboise Glacee ~ FREE! I really like the finish of this nail polish and the lilac is perfect for spring. Will definitely be buying more Inglot nail polishes. The color selection is gorgeous. have you tried their shower gels and skincare? it's awesome, and smells sooooooooo good! Everything you bought is simply gorgeous. 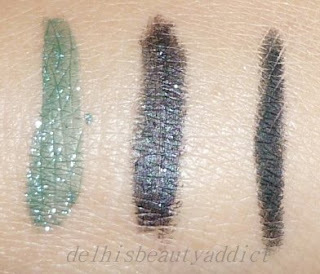 I LOVE the green eyeliner, and I'm so tempted to try L'Oreal Infallible now! I love the haul! The green glitter liner looks pretty! where do you buy Inglot stuff? great stuff! now I want to try l'oreal infallable hehe because lip products usually only stay on my lips for like a minute before i eat or drink something then it's gone! Lovely haul! I especially love the green eyeliner from Bourjois. I have been wanting to buy a rich, green liner. I think it would complement brown eyes rather nicely. The nail polish you got is equally pretty. I love color like that for Spring! loving the colour of that inglot polish! Not tried loreal product much for some reason. Let me get my hands on them from now on. love the INGLOT polish and the bourjois scrub thingie !! even I spotted the YSL rouge when I was strolling in ambience , oh my , its so ridiculously priced nuh the packaging is to die for !! wat to do! cant help suckers for packaging, include myself! I want that lip scrub, in fact everything in the picture! very badly! 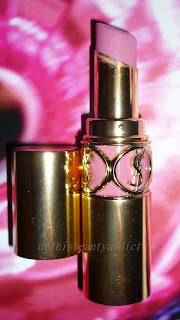 The ysl color is soo pretty. and the packaging too! and the loreal infallible is gorgeous. also the e/s and the nail polish too! LOL. And, wow! 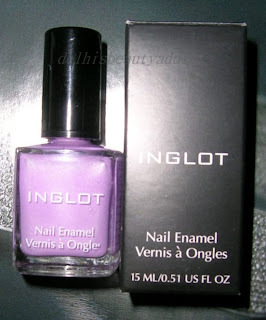 Inglot :D Did you know it originates from my home country - Poland? ;D I used to buy only it, before I moved to SG. It's such a nice brand =D Love their nail polishes. Thanks for the lip swatches! except the first color the rest are suitable for u.
I actually like that YSL lippie on you! Admittedly, I'm partial to cool toned pinks. I may also be distracted by the gorgeous packaging. I don't care about the lipstick; I just want the gold tube! LOL! love all the stuff you got! too bad about the ysl lippie though... so many ppl rave about it and i wanted to try it, but i just can't find a color that i think would work on me. everything is too bright. the ysl lipstick looks really nice. i am actually looking for a nice shade of pink lipstick. im considering this. i must plan very well. haha. I adore the nail polish. 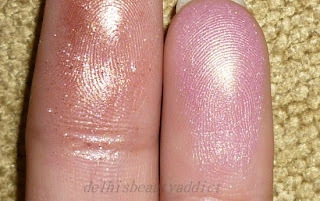 I bought a purple nail polish last spring HOPING that it would be the same colour as yours, but it ended up being too bright and looked REALLY bad against my skin. Oh well. I forgot to say that you should check out these lipsticks! Oooh, I would buy that YSL lipstick in a heart beat just for the sheer beauty of the case!! Soo delicate and beautiful! + the color looks great on you =) Hope all is well!! Love your reviews. hey i am so glad i read this post! i recently did a lipstick review for rati and was in doubt about the price of the ysl rouge volupte. i thought i got it for 2700! talk about forgetfulness! i'll tell her to correct the price right away. I am loving that colour..Rose Toubib from Bourjois..